By default, all Internet browsers update automatically when a new version is released. However, some users may not want to update because they like the version they are currently using or would like to select which updates they receive and when. The following section will show you how to turn off automatic updates in the Mozilla Firefox browser. In the upper right-hand corner of the screen click the button. From the drop-down menu that appears, select . On the left-hand side of the screen, make sure General is selected. Scroll down the page until you find the Firefox Updates section. 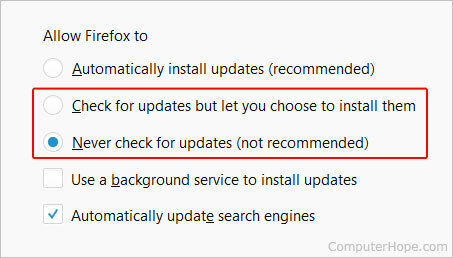 Under Allow Firefox to, you may choose to either update manually, or turn off updates entirely. What is architectural design software?